Things have gone from bad to worse for the Seattle Mariners. As the team continues to fight in the crowded American League wild-card race, the Mariners continue to suffer injuries to their pitching staff. 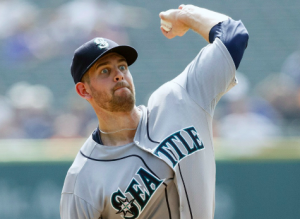 The latest is lefty James Paxton, who was placed on the DL Friday night for the second time this season. This time around, Paxton has been lost to a strained pectoral muscle. The injury is likely to keep him out for at least a few weeks. Paxton suffered the injury during Thursday’s start against the Angels. He was taken out with one out in the 7th inning and ultimately took a no-decision. The game broke a string of seven straight starts Paxton had won, dating back to early July. Before going to the DL with a strained forearm in early May, Paxton was one of the best pitchers in baseball. He struggled initially after coming back at the end of May. But over the last month, Paxton regained his form from early in the season. In six starts during the month of July, Paxton was 6-0 with a 1.37 ERA. However, that success has come to a grinding halt with his second DL stint of the season. In 20 starts this year, Paxton is 12-3 with a 2.78 ERA. With Paxton back on the DL, the Mariners are once again without their four best starting pitchers. Drew Smyly has missed the entire season, ultimately undergoing Tommy John surgery. Hisashi Iwakuma has made just six starts this year because of shoulder trouble. He continues to work his way back but has not pitched for the Mariners since early May. Finally, Felix Hernandez returned to the DL last week with shoulder bursitis. He may not be ready to return until the end of August or early September. Amidst all the injuries, the Mariners are scraping the bottom of the barrel with regard to their starting rotation. Currently, Seattle’s rotation consists of Yovani Gallardo, Ariel Miranda, Erasmo Ramirez, and Marco Gonzales. On paper, it’s a rotation that doesn’t exactly stack up against some of the other teams competing for one of the two wild-card spots in the American League. Replacing Paxton on the active roster is rookie Andrew Moore. Moore is just 1-3 with a 5.65 ERA in the big leagues this season. However, he’s performed well in the minors this year, and at this point, the Mariners have few other options. The Mariners may not get Paxton, Hernandez, or Iwakuma back from the DL until September. Despite the rash of injuries to their pitch staff, Seattle continues to push forward toward a playoff spot. The Mariners are one of six teams within two games of the second wild-card spot in the American League. With their pitching staff decimated by injuries, few would consider the Mariners favorites to earn a place in the wild-card game. But if they can tread water for a few weeks, the potential return of a few starters in September could give them the lift they need to reach the postseason.